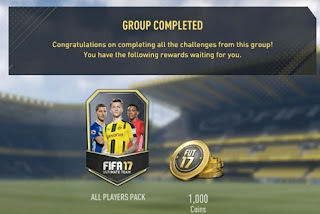 In FIFA 17, a new squad building challenge is live: the " Seven Club Challenge". We show you a possible solution for the task. A new feature in FUT 17 is the squad building challenges, the SBCs. In this mode in the Ultimate Team, you can exchange your player cards for various prizes. All information about the SBCs in FIFA 17 you can read here. These SBCs can be divided into the categories Live, Basic, Advanced and Leagues. While a few days ago, the "loyal boys" challenge was available, now for two days the "7-Clubs-Challenge" is a live SBC. What are the prerequisites and prices? The price for this SBC is manageable: it is about 1000 coins and a single-player set. Since this challenge is not too challenging and can be met with your "remnant cards", the reward is probably appropriate. - Different leagues: At least 5. - Different nationalities: At least 5. - Player Quality: All Gold. - Team Chemistry: At least 39. If you do not sell all players from your packs right now or place them on the transfer market, you should quickly find them in your club. These are quite good players, who meet all criteria. However, there are countless other combinations.